As the digital landscape develops and shifts year after year, it’s important that we take a look back and take a look forward so we can do more of what is working well and pivot in areas that either aren’t working as well or hold potential for growth in the new year. With the way digital marketing has moved toward heavily leaning on visuals with photos and video content becoming the top media formats on the top platforms such as Facebook and Instagram, we’ve seen a considerable shift in design and visuals being what people are focusing on with building their brand. While beautiful design and visuals are important, having good, solid copy is also vital because it provides context, especially when online viewers are not consuming every aspect of your content, such as sound (according to an article on Digiday, 85 percent of Facebook video is watched without sound). With that in mind, it’s critical that you think about all the people in our audience. Are you catering to them both visually and audibly? One way to do this is by writing captions for your posts and Instagram Stories to provide context and explain the value you’re presenting to help your audience decide if they want to engage or watch further. Additionally, you may want to review your website copy to ensure that you’re adequately explaining who you are, what you do, who you serve, why, and how someone can go about working with you. Remember beautiful design and visuals are meant for capturing attention, but copy (i.e., the words) are what will convert your potential client from scrolling to an inquiry or scheduled appointment. Even though there is a lot of online noise and content being pushed out onto newsfeeds, it's still crucial that you create your own content. So long as you’re creating high-quality, high-value content, you’re not contributing to the noise. Creating high-value content means sharing your best information to demonstrate your expertise and educating rather than selling. This kind of content can come in the form of Facebook Lives, Instagram stories, blog posts, consistent emails that you're sending your list, etc. The key here is putting out content specifically formatted for each channel, which I know sounds like a lot of work, but there are ways to go about this so that you don't drive yourself into the ground, specifically with a concept called content repurposing. For example, something I do with my Facebook Lives is I get them transcribed, then turn them into my blog posts (like the one you’re currently reading! ), that way if you are not someone who loves to watch videos, or you just prefer to scroll and skim through the points, you can do what works for your lifestyle. 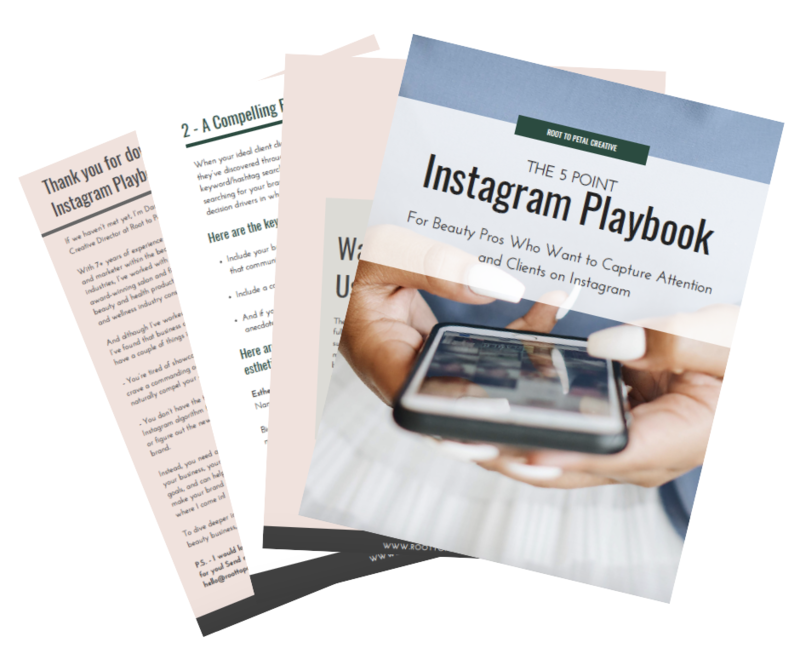 Learn how to get found by your dream clients, turn scrollers into scheduled consults and bookings, and get Instagram working for you. This was a big thing in 2018, but even more so in 2019, you’re going to have to put a little ad spend behind your content if you want your ideal clients to see it. This may sound less than ideal, especially when just a few years ago you didn’t need to spend money for people to see your posts on social media, but this is the current reality of digital marketing, and the plus side is that with the Facebook and Instagram ad platform you have the best targeting tools that have ever existed allowing you to get directly in front of the people who matter to your business (aka your ideal clients). Yes, it's annoying that five years ago you could put things out on Facebook and get excellent engagement without paying a dime, but this is the cost of business. Just like how maybe five years ago you would pay to take a local print ad out in a local newspaper, that part of your marketing budget now needs to be reallocated to go online. I'm going to say that conversational marketing gain significant traction this year, but by 2020 it's going to a primary marketing channel, so while this is a little bit more of long-game strategy, 2019 is the time to get a move on it. If you’re not familiar, conversational marketing is also called chatbot marketing or Messenger marketing. If you’ve ever gone onto a website and seen a little chat bubble with the Facebook Messenger icon saying “start conversation with us “or you've gotten a message in your inbox that has tabs that you can click on that guides you through a conversation, you’ve seen Messenger marketing in action. The reason why conversational marketing is going to be huge this year is because it’s catering to today’s consumers who want instant communication. Not only can you answer frequently asked questions and help guide potential clients to the information they need to help them make a purchasing or booking decision (without having to be on your phone 24/7), Messenger marketing also can serve as an ad channel and website support agent. For brick and mortar businesses such as spas, studios, and salons that would benefit from an in-person reception desk, think of conversational marketing like your online reception desk. Now I want to address the little thought that may be lurking in your head about chatbot marketing. You might be thinking, “Ooh, chatbots sounds kinda scammy and weird.” Listen, there's always going to be spammy people in marketing that just want to sell, sell, sell, and push things down your throat, send you messages every day trying to get you to buy something, and that’s not the type of marketing I'm talking about. There's a way to go about Messenger marketing that's very organic as well as providing a high-touch level of service for your clients and potential clients, and the way you do that is through authenticity, which is my number five of what you need to embrace in your 2019 marketing. I know authenticity is a word that's a bit intangible and overused, but the core of it is just being honest, open, and helpful, and serving from a place of genuinely wanting to do good for people. Share your knowledge and expertise, don’t be afraid of giving away “too much” because by being helpful you’re building trust. Also, let you shine through. People connect and buy from people, and while you may offer similar services or sell the same products as a nearby competitor, no one can be you, so leverage that and be real. So there you have it, the top things to embrace in your 2019 marketing! If you have any questions for me, leave them in the comments below, I’d be happy to nerd out on more of this with you!